For today’s post I have a special guest writing team with some profound things to say. Jon and Jannine are old friends of mine and the parents of Caitlin (3) and Isobella (11 months) – aren’t these girls delightful? Jannine and Jon have been married for 14 years, and are currently the pastoral care directors of Living Well Church in Rotorua. Most of this post comes from Jon, but Jannine has canny words for mums in particular towards the end. Welcome! Three years ago I became a dad, and of all of the things I have been or done or achieved, as clichéd as it sounds, that one event changed my life. 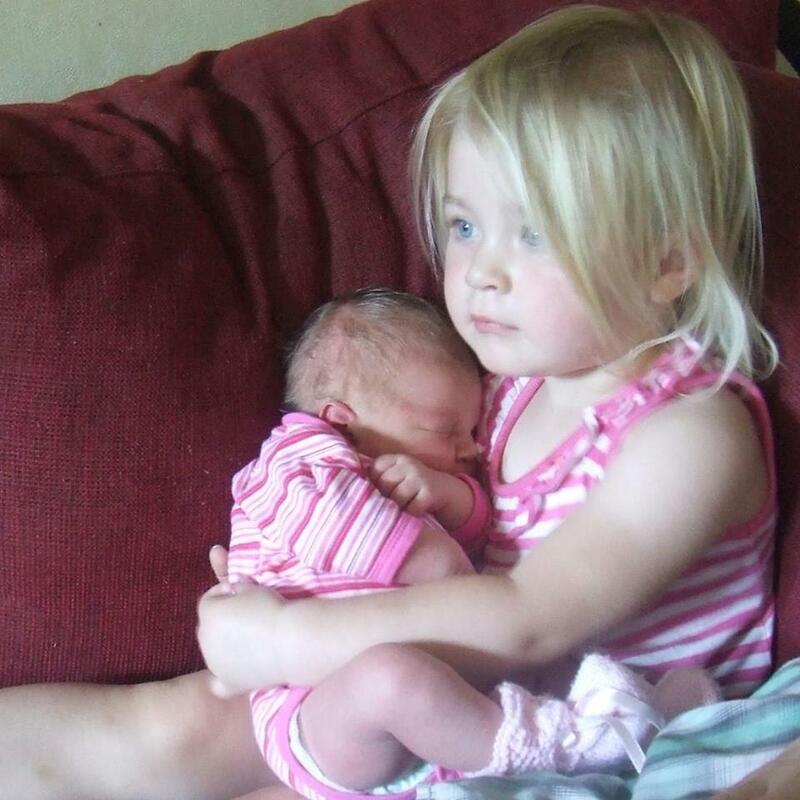 I like to think that I am a great dad, in part because I have two beautiful little girls who needed me to man up, in part because I have friends and family around me that have encouraged me to be better, but mostly, it is because I have a fantastic wife who believed I could be a great dad. As I sit and ponder some of the things that my wife, friends, and family have done to help me, five things stand out, five things that will help you (partner, wife, family member or friend) help a new dad in your life to make that transition from father, to dad, to superhero. So here they are, in the Sacraparental New Year’s Guide to Supporting a New Dad. My wife let me choose the nappy bag. Now as funny as that seems to some of you that are reading this, her logic was faultless. She wanted me to feel like I could take a child into the big wide world, all by myself, and she knew, that because I chose the nappy bag, I would be more inclined to carry the nappy bag. As cute as you think your nappy bag is, remember, that there are times when you expect him to carry it, and if he has to carry it, he should get a say in it. So, ask his opinion, include him. Cloth nappies or disposables, do we want a stroller with three wheels or four, pre-school or kindergarten, how will we discipline our child: if you allow him to be a part of the decision-making process, even expect it of him, it is no longer just about you, or about her child, it is about our child. When new dad feels like he has been a part of the process he has an invested interest in the outcome of that process. We are new at this. And it is big, and it is scary, and although the new dad probably won’t admit it to you, we are haunted by the questions: what if I stuff it up, what if I am not good enough, what if I get it wrong? And we will. There will be days when not all of the fingers make it out of the sleeve, there will be times when the poo from the nappy he was supposed to change is mushed into your screaming baby’s armpit. There will be times, (and yes, I have done it before), when he is so distracted making racing car noises that he crashes the pram into your ankle. There will be times when the baby rolls off the bed, and times when she eats cat food off the floor, there will be times when he forgets the nappies, or the dummy, or the bottle, or sunscreen. We will make mistakes, we all know that. If you want to support the new dad in your life, please allow him a little bit of grace. Now, please hear and understand I am not talking about being negligent, that is another problem for another post, but if you allow him the odd mistake without berating him, or belittling him, he will be more inclined to get it right next time. There are so many fantastic books and blogs out there, there is something for everyone, but I am not just talking about putting information in front of new dad. Those things are all great, one of my favourites, a book called Call Me Dad, a manual for new fathers, written by dads, for dads, was one of the most helpful books we could find. Of course, there are a myriad of blogs out there, and most of them are helpful, but I am talking about setting new dad up to be the hero with physical tools: like a pink tea set. One of the coolest gifts I got from my wife was a little pink ceramic tea set in a small pink wicker basket. That one little tea set has provided many hours of tea parties, and some of my favourite memories with my little girl. Giving him the tools he needs to be a great dad is one the best things you can do to support new dad. Not that stuff-and-things is the important part of the relationship he is building with his children, but if you provide the things he needs to be a great dad, he can become a great dad. Buy him stuff that he can make memories with. Friends of new dad, all those books you have gathering dust on your bedside table, that you don’t read anymore, he may. Post things on his social media page that he can glean information from, give him cool mother’s day ideas, fun rainy day games he can play with children, great recipes to cook with little ones. New dad wants to be a part of this. Help him to do that, and if I can return to the nappy bag, I had many great adventures with my little one, in the cool stroller that I helped to pick out, with the nappy bag I chose, because I was confident, and I had the tools to take the little one out of the house, on my own. New dad will need to be encouraged. We are scared, frail and weak, and to be honest, most of the time we are making it up as we go along. You guys have the hard job. None of us, as manly as we might be, would want to go through all the things you have done to bring this precious little bundle into the world. You deserve all of the thanks and the encouragement, but spare a thought for new dad. New Dad needs to be encouraged. Tell new dad that he is doing a great job. Find the things he is doing well and encourage him. If you want to support new dad, thank him for being a good dad, and encourage him to be a great dad. Acknowledge him and the things that he does for your family. New dads need to know that what they are doing matters, and a little bit of encouragement, or even a thank you is a perfect way to do that. Friends of new dad, if you have been new dad, say the things to him that you wanted or needed to hear, take him out for coffee and smile and nod as he spouts incessantly about the little pink bundle that he helped to create. Remember that you were once new dad, and probably did the same things. And this is where I interject (Jannine, Jon’s wife). Please be kind to the new dad in your life. You new mums are tired, exhausted, your body has changed dramatically over the last 9 months and hasn’t finished changing yet, you smell of baby and milk, crave foods you cannot eat if you are breastfeeding, and hormones, well let’s not get started on that. The easiest thing to do is be mean. But instead, please be kind. When you’re tired and grumpy, stressed and anxious, please also be kind. Don’t make it personal, don’t say things you will regret later, and don’t make your partner out to be incompetent, especially in public. When there are problems, keep a short account, apologise and ask for forgiveness regularly. Cook his favourite meal if you are able, buy him a treat or a present, let him have plenty of cuddles with the baby even when you think it should be in the bassinet. Tell him if there is something he can do to help, and be honest if he can’t, and don’t blame him or berate him. Remember he would move heaven and earth to fix it or make it better. Give him what you can, he will understand and love you for it, after all it is only a season and this too shall pass. So, there you go, five ways to support a new dad. New dad needs the support and encouragement. The world needs great dads, and the things on this list will help new dad make the transition from father to superhero. Thanks heaps, Jon and Jannine! As the wife of a not-that-new dad myself, I find this list both helpful and a little convicting. I’m keen to revise! 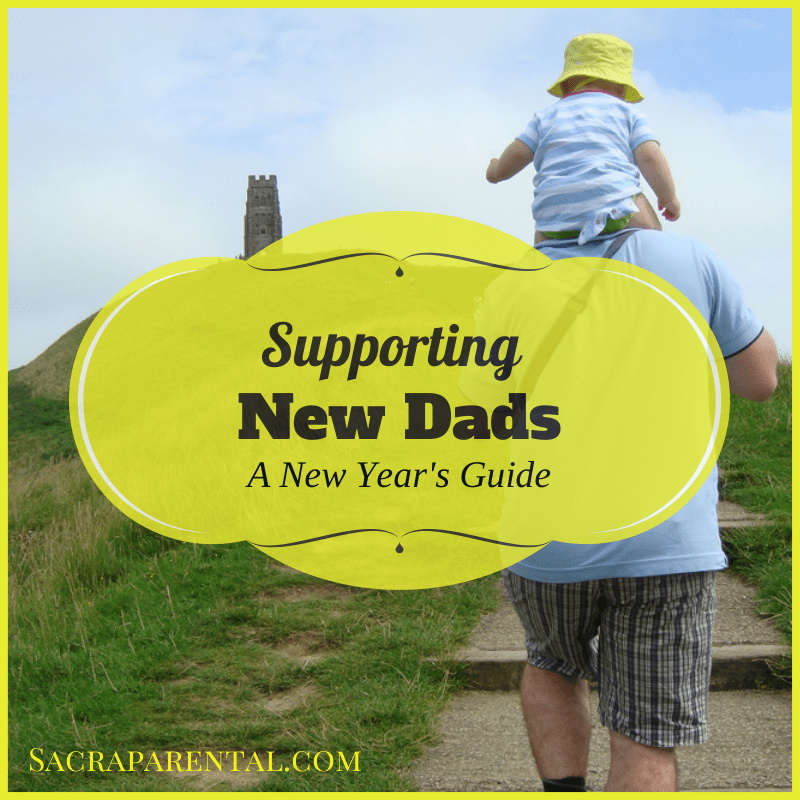 What are your tips for supporting new dads? Dads, what do you wish people had done for you, or what was it that made a positive impact in your early days of fatherhood? For more dad-type-tips, see this post on how to be a Superhero Partner to a pregnant woman. I’d love to have more specifically dad stuff on Sacraparental, so if you have an idea to contribute, please get in touch. dads have got a far harder road to walk than mums. the role men are meant to fill in society is far more ambiguous and nebulous. Telling a new dad that he’s allowed to lead would be a massive boost and encouragement to him. Andrew I’m just not sure it’s useful to get into a battle of who has it harder. Let’s face it no one is ever going to experience it from both perspectives. What we can do is try and understand our partners as both come to terms with that earth moving change of becoming parents. I agree that men’s role in society is ambiguous and nebulous, but I think you can say the same for women too. If i moderated the first sentence by saying that it was a hard road to walk, it might be better. It would be a wonderful service to all of us if we agreed on what we all had to do in our roles. Remove ambiguity. Not likely to happen any time soon. One of the things i find absolutely terrifying is being the sole provider of our family (2 kids now. 3 any week now) is that there are many small people who depend on me holding down my job. It wasn’t a whole macho thing of the guy having to be the provider, just wanting to give my wife the option of being at home with the kids if she wanted to. she’s loving it. no regrets in the time she’s able to invest in the kids. It absolutely warms my heart when my wife tells the kids i spend all day working hard for them. to know i’m appreciated and not taken for granted. An aside regarding kids. i was listening while driving today to an interview Al Mohler had with a demographer who wrote a book “what to expect when nobody’s expecting”, and an observation was that people who attend a religious service once a week (doesn’t matter what flavour of religion) tend to have more children, and among those people, the most conservative / orthodox have the largest families. It was observed among all manner of groups. Hi there. I have been reading your blog for a wee while (via kiwi mummyblogs) and have been wondering if I knew you from Palmie days gone by. Reading this post by Jon makes me think you are who I think you are!! I’m Rosie, Mark’s sister, we were all at youth group together I think – or similar circles at least. Really enjoying your blog. Loads of great stuff. Thanks for the kind words – and great to hear you found us through KMB. I tend to get a couple of visitors from there each day and often wonder if people stick around. What are you up to now? Still playing lots of piano? Hi again. My poor piano is doing a great job of displaying photos but not much else Am living in Mt Maunganui with teacher hubby plus 2 little boys (5 & 4) and a baby girl (1). Was teaching but am now loving being at home with my kids. Keep up the great work on the blog. Oh and hi Jon – great post! rosie? fantastic to hear from you. how have you been?